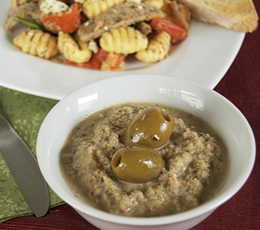 This simple sauce works well for a pasta dish but would be great as a bread dip too! Thanks goes to our Featured Foodie, Jenny, with savourthesensesblog.com for this one! In a large saucepan, sauté the onion and 1 tbsp. oil over medium high heat (about 5 minutes). Add the broth and milk, then bring to a simmer. Once simmering, remove the pan from the heat and add the olives. Stir in lemon juice to taste before serving over pasta.